I’m really getting into this whole fall thing. It’s beautiful! There are apples and giant pumpkins everywhere. It feels like really Fall rather than a season contrived for selling Halloween candy. The temperature is just about perfect, although I can tell it’s cold enough to motivate us to move south. Pirat went back into the water on Monday. 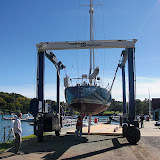 I can’t get over how spectacular the boat looks when it’s out of the water, especially compared to other boats around. We only had one, small mishap putting the boat in. When Lee started driving out of the haul-out slip the wind pushed Pirat sideways just enough to sideswipe a rust metal covered piling with the port rail. We were so close to missing it and a boat yard guy and I tried to fend the boat off (just a little too late). The rail is now missing about 4 inches of gel coat, all the way down to the fiberglass in places. 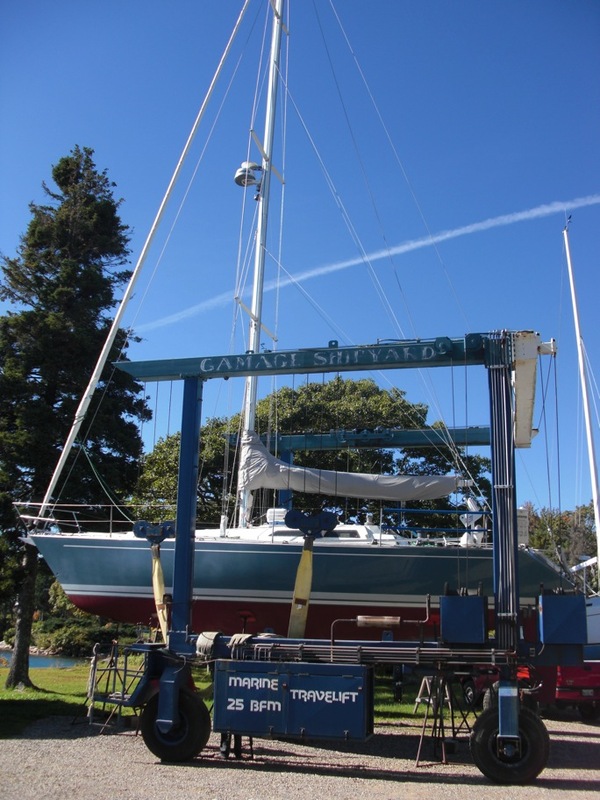 It’s really not too bad but the boat yard generously offered to provide us with awlgrip in the correct color to fix it. They were kind of rushing us out of the slip and the guys on the windward side of the boat could have been holding their lines a bit tighter. All in all, it was refreshing to have them take responsibility for something that happened at least partially on their watch. Lee motored Pirat back to our anchorage in front of Fish Lane by himself because I was at an appointment. He’s been working on the engine alignment and seems to have that figured out now. He also installed our new holding tank (Yay!). A storm is moving through tomorrow so Pirat is battened down at anchor again. I’m tying up projects like a new mattress pad for our bunk, food provisions, laundry, and wedding planning! Yes, I found time during our busy preparations to sail to work on the wedding. We officially have a date and a place so I can finally start working on save-the-date cards. Yay! Looking forward to the wedding makes me even more excited to get to the Caribbean. Our new intended departure is set for Sunday morning. That should keep us out of the system passing through and get us to the Cape Cod Canal on Monday morning. Here’s some more pictures from the launching. We are definitely lacking seasons out here! And we’ve had a mild summer, so transition into fall has been distinguishable. How often will you need to repeat that intense cleaning ritual? Not very often, fortunately. We won’t be able to do this again till the next time we haul the boat, which could be a year or more from now.